Hosted Graphite has several options for dashboards - this guide walks through setting up a Graphite dashboard. The other options are Grafana Dashboards, and tasseo. In the following guide, we’ll walk you through creating a simple graph for a chosen metric, and adding that to a dashboard that you can bookmark for quick access. If you haven’t sent any metrics to Hosted Graphite yet, check out our Getting Started Guide. In this example, we’re using a metric called conc_users - the number of users logged into our imaginary application. 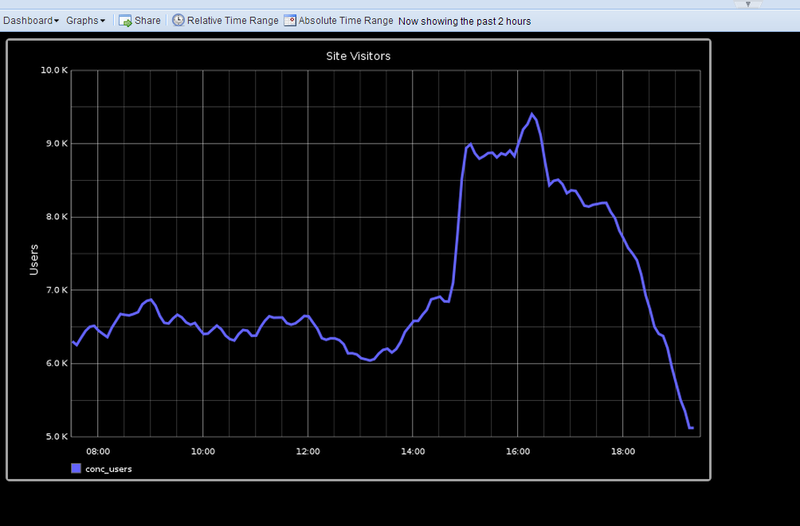 We have been sending the metric value (such as the one below) once a minute to Hosted Graphite for the last day. When that opens, you’ll be presented with a blank composer dialog. On the tree on the left hand side, expand the ‘Graphite’ folder. This will contain all the metrics sent using the API Key associated with your account. At the moment, there’s only one entry - our demo conc_user metric, so we click on that. Tip: If you’re going to be sending a wide range of metrics to a Hosted Graphite account, this ‘Graphite’ folder could soon have an unmanageable number of entries. Using periods in your metric names will introduce a folder structure, allowing for logical grouping of your metrics. E.g. servers.mario.memory.free will result in Graphite\servers\mario\memory\free in the tree above. See the Graphite Project website for more info. If you’ve tried the above but see an empty graph, then consult our Troubleshooting Guide. Choose a start date/time and an end date/time. This is useful for debugging a new metric, or for investigating an incident that occurred during a specific time window. View a rolling window of the most recent metric data, up to a specified number of minutes/hours/days/weeks/months/years. Tip - If you make changes but the graph doesn’t update automatically, use the Update Graph button to trigger a refresh of the graph. In this example, we want a view of the last 12 hours of the conc_users metric, so click Select Recent Data and enter the appropriate values. Makes our graph a continuous line through our available metric points. Sets the title to Site Visitors. Set this value to 3 (pixels) for a slightly thicker line than the default. Metric timestamps are sent in UTC. The server (in this example) sending the metrics is in Dublin - Set this to Europe/Dublin to apply the appropriate offset to the X-axis timestamps. Set the vertical axis label to Users. Click on the floppy disk icon in the composer toolbar to save. You’ll be prompted for a name, enter Site Visitors and click OK. Your graph is now saved, and can be recalled at any time by browsing My Graphs in the left hand window of the Composer. In the dialog that opens, an entry called Site Visitors will appear. Choose it and then click Select. 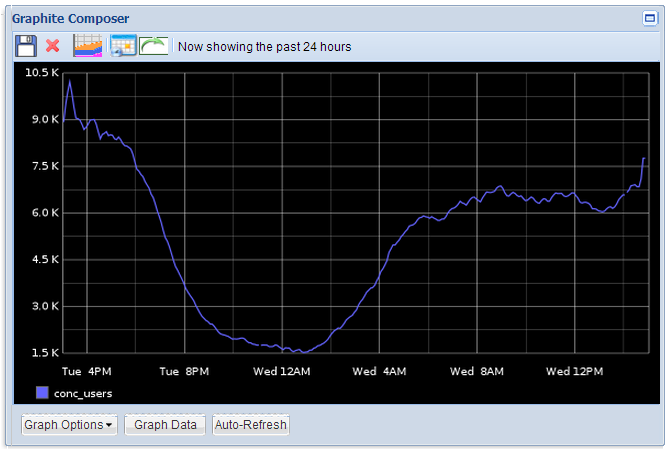 Your graph will appear in the dashboard. Let’s make our graph a little bigger. Click on Graphs -> Resize, and choose the Custom option. Enter in a width of 800 and a height of 500 (or whatever suits your display). Tip You can further customize the graphs for this dashboard instance by clicking a graph once to focus it, and clicking once more to bring up a configuration menu (This is the same menu we used when creating the graph - See Graphite Graph Menu Reference for more info). To save your finished dashboard, click Dashboard -> Save As and enter a name, e.g. MainSiteDash. To get a bookmarkable URL (which will directly open this dashboard instance), click on Share in the menu. A dialog will appear (you may be asked to save again) containing a URL that you can copy. Finally, you can see all dashboards that you own by clicking Dashboard -> Finder. A dialog will appear with a list of all the dashboards that you have saved. In this case, every single metric matched by this wildcard will be queried, even if many of those metrics don’t have data for the selected time range. Multiple, but narrower targets in a graph may result in faster load times than one widely defined target. 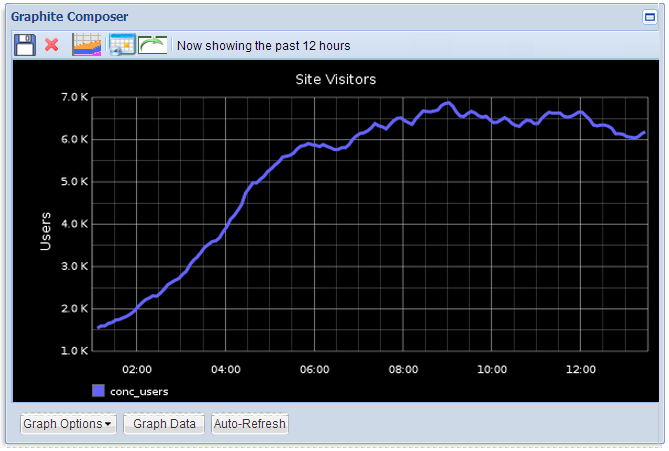 The graph should automatically update to show the derivative of our conc_users metric. If not, click the refresh button. If several transformations are applied to a target, the function calls are nested, with the most recent one on the outside. E.g. To undo a function you just applied, click the target and use the Undo Function. The outermost function will be removed from the target text. You don’t have to use the Apply Function menu - you may also select your target, click Edit, then manually edit the target text by hand. A quick summary of the Apply Function menu is as follows. Some functions are used on multiple targets (either by selecting multiple entries in the dialog, using wildcards, or both). More information about functions can be found on the Functions page on the Graphite Docs Page. Create a new set of datapoints after applying a transformation such as derivation or timeshifting to the input. Perform running calculations on the datapoints such as a moving average, or forecasts. Discard, limit or maintain counts/maximums/minimums of the datapoints. Miscellaneous functions, that mostly contain routines that control the appearance of that target on the graph - For example setting a legend name, or line color.